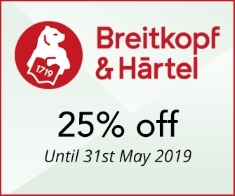 This month we have launched two new special offers of up to 25% off publications by Oxford University Press and 25% off the entire catalogue of Breitkopf & Härtel until the 31st May. 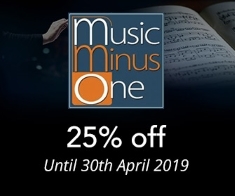 We are also continuing our offer of 25% off the complete Music Minus One catalogue until the 30th April. Music Minus One was founded in 1950, and their sing-along and play-along volumes quickly became an industry standard. Their range features repertoire for soloists and chamber musicians from a variety of popular classical and jazz composers. Players can listen to the full recording with a soloist, but then can remove the soloist in order to step in and play the lead themselves. 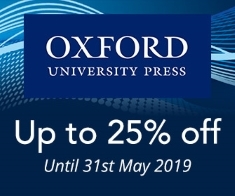 Until the end of April we are offering 25% off their publications. The theme that forms the basis for this much-loved concert work is in fact an original Tchaikovsky theme written in a classical rococo style. In a nod to the classical era, Tchaikovsky wrote the piece for a smaller orchestra than was typical in his High Romantic era. Each of the eight variations are run together with only a fermata to separate them. It is pure magic, minus you! All that's missing are your vocals! The music in this book includes the lyrics, vocal lines, and piano accompaniments for ten Disney favourites. The online audio tracks contain demos for listening, and separate professionally-recorded full-band backing tracks so you can sing along and sound like a pro! Also available for Male Singers. Oxford University Press is one of the longest-established music publishers in the world, including an unrivalled range of choral music as well as classroom and instrumental teaching materials, and authoritative editions of music by composers such as Ralph Vaughan Williams and William Walton. Until the end of May we are offering up to 25% off over 3,000 titles from their catalogue. For female gospel soloist, SATB, and jazz ensemble, Passion Music continues the fusion of jazz and choral music so successfully blended in Todd's Mass in Blue. The structure highlights different points in the Passion story, including a new setting of 'Greater love has no man' and an evocative Stabat Mater. Score and Parts also available. The one-act ballet Job has been described as one of Vaughan Williams's mightiest achievements. It is a work which, in a full production, combines painting, literature, music, and dance. The work was inspired by William Blake's Illustrations of the Book of Job, and includes quotations from the King James Bible. The result is a musical masterpiece, combining the ancient and the modern. For mezzo-soprano solo, mixed choir, and orchestra or chamber ensemble. Feel the Spirit is a cycle of seven familiar spirituals equally suitable for concert, school, or church use. These vivid and expressive arrangements can be performed individually, or as a complete cycle that showcases the rich heritage of the spiritual. A diverse collection of seasonal organ music for manuals only, covering the Church's year from Lent to Pentecost. The pieces include a mixture of established repertoire, attractive new arrangements, and two newly commissioned pieces. The collection is technically accessible and provides approachable repertoire for all church musicians. Fifty-five short pieces, the earliest of which dates from 1967, the most recent from 1993. Taken as a whole, this selection of pieces (chosen by the composer) provides a rich overview of the keyboard music of one of Britain's most original and fascinating composers. Founded by Bernhard Christoph Breitkopf in 1719 in Leipzig, Breitkopf is the world's oldest music publishing house. Known for its scholarly editions of composers such as JS Bach, Mozart, Schumann, Mendelssohn, and Brahms, it also publishes the works of more recent composers. In celebration of their 300th anniversary year, we are offering 25% off their entire catalogue of over 10,000 items until the end of May. Until the last performance of this work under his direction in New York in 1909, Mahler made revisions again and again. This edition strives to present a reliable music text of the final extant version that in 1910 Mahler corrected and deemed accurate for the new print. The Editorial Report gives detailed information on the provenance and evaluation of the sources as well as authentic annotations on performance practice. Individual comments document editorial interventions and deviations from current editions. The many years of in-depth research have uncovered several new aspects concerning performance and interpretation, especially regarding the Fourth. Moreover, it was also high time to examine the generally very reliable “old” Brahms Urtext of the Complete Edition of 1926/27. The result is an authoritative musical text that is free of transmission errors and unauthorized additions.